This page will take longer to load since it contains our on-line selections of Spectacular Items for several mineral varieties. NOTE: If the images on this page do not load properly (or if they take too long to load! ), then you should visit our Alphabetical Mineral Index where there are links to separate pages for each mineral variety. The images of our Spectacular Items on these specific mineral variety pages will load much faster. Our Spectacular Items are sold and replaced on a daily basis, so do come back often! This beautiful agate decorator specimen was sawn and polished from a natural agate geode that was mined in Rio Grande do Sul, Brazil. The base was sawn flat so that it stands in the position shown. The open cavity or vug in the center of this geode halve is lined with botryoidal chalcedony formations covered with drusy quartz crystals. The banded agate layers around the rim have some very interesting patterns in shades of light to dark gray and black. This superior quality agate geode halve was sawn and polished from a natural color agate geode that was mined in Rio Grande do Sul, Brazil. The base was sawn flat so that it stands in the position shown. The open cavity or vug in the center of this geode halve is lined with thin layers of tan color chalcedony covered with tiny drusy quartz crystals. This superior quality agate geode halve was sawn and polished from a natural color agate geode that was mined in Rio Grande do Sul, Brazil. The base was sawn flat so that it stands in the position shown. The open cavity or vug in the center of this geode halve is lined with layers of tan color chalcedony covered with brilliant drusy quartz crystals. Giant Banded Agate Pendant in Sterling Silver! This extra large size pendant is 2.8" long x 3" wide!! This extra large size agate pendant was handcrafted in 925 sterling silver and set with an unique cabochon gem of black and white banded chalcedony (banded chalcedony is also known as agate). This beautiful banded agate cabochon measures 76mm wide x 52mm tall (3 inches x 2 inches!). This genuine carnelian pendant was hand-crafted in 925 sterling silver with open back settings and set with an 18mm round carnelian cabochon gem (carnelian is the reddish-orange variety of chalcedony). The carnelian has orange color under incandescent light as shown in the photo at left. This beautiful pendant is also set at the bottom with a 4mm round faceted gem of genuine red garnet. This moss agate bracelet was hand-crafted in sterling silver and set with five natural moss agate cabochon gemstones of different shapes and sizes measuring from 22x12mm up to 22.5x18.5mm. The moss agate gemstones in this bracelet have black dendritic formations within a matrix of translucent agate (chalcedony) and white opal. See also a full view photo of this genuine moss agate bracelet. Size: 7.1" long x 4.3" x 2.8"
The matrix of this natural decorator mineral specimen is snowy white clevelandite (a variety of albite). There is a 3.8 inch long golden-yellow muscovite mica crystal which formed on top of the white albite! This natural pegmatite specimen was mined in north-eastern Minas Gerais, Brazil. Muscovite Mica Specimen Dimensions: 7" long x 5.5" x 4.4"
This beautiful decorator mineral specimen is completely natural. 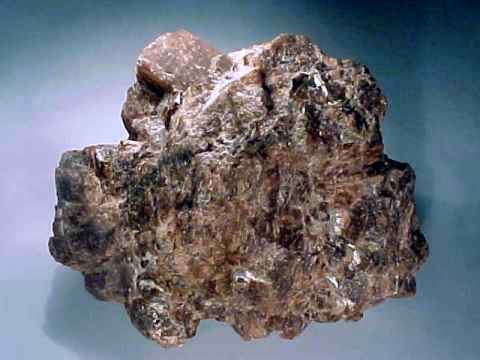 It is from the Ouro Fino pegmatite mine, and has a matrix of beige and white color albite feldspar with golden-green muscovite mica crystals. Dimensions: 7.5" x 6.1" x 3.1"
This decorator specimen of sillimanite-biotite schist matrix has reddish-purple almandine garnet (also known as almandite). The chatoyant sillimanite has long blade-like form. This fine quality bracelet is set with thirteen beautiful cabochon gems of natural almandine garnet, citrine and peridot! There are three lightly included 20x15mm natural red garnet cabochon gems, four 10x8mm oval shaped citrine cabochon gems, and six 6mm round cabochon gems of natural peridot! This genuine red garnet jewelry design is set in sterling silver. The photo at left shows a close-up, see also a full view photo of this bracelet of red garnet with citrine and peridot. This wonderful garnet bracelet is made of solid 925 sterling silver! This fine quality garnet bracelet was handcrafted and bezel set with 28 cabochon gemstones of natural garnet with very rich deep purplish red natural color! These superior quality garnet cabochons are lightly included, and they measure from 5mm up to 12x6mm each. This genuine red garnet jewelry design was handcrafted in fine 925 sterling silver. This genuine red garnet pendant was handcrafted in sterling silver and set with a 10x5mm marquis shaped faceted gemstone of natural dark red almandine garnet and with a 22x16mm rectangular shaped black onyx cabochon gem. Natural red garnet pendant with a garnet gem weighing 24 carats! This large red garnet pendant was handcrafted in 925 sterling silver and set with a lightly included 20x15mm oval shaped almandine garnet cabochon gem with beautiful deep purplish-red natural color! See also a full-view photo of this fine quality natural red garnet jewelry design. This beautiful smoky quartz with garnet pendant was handcrafted in sterling silver and set with seventeen faceted gemstones of natural red garnet and natural smoky quartz! This pendant has eight marquis faceted natural red almandine garnet gems measuring 9mm x 4.5mm, and it is also set with eight beautiful 4.5mm round faceted gems of natural smoky quartz encircling the pendant with a large 7.5mm round faceted natural smoky quartz gem in the center! This hand-polished piece of natural copal amber was mined in Colombia. It formed from ancient tree sap which hardened over time after falling to the earth over 1,500,000 years ago and becoming buried by sediments. It is semi-transparent to transparent and has beautiful golden-yellow color. 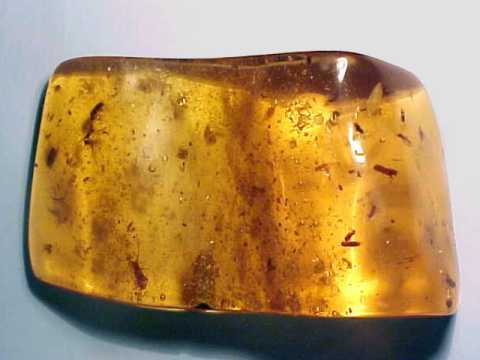 This genuine copal amber specimen has an assortment of interesting 1,500,000 year old insects still trapped within it. See also a full-view photo and a different close-up photo. Copal Amber Dimensions: 4.5" long x 2.1" x 0.8"
This piece of natural copal amber was mined in Madasgascar. It has been partially polished by hand on some surfaces to better show the insect inclusions. This copal amber specimen formed from tree resin which hardened over time after falling to the earth between 1000 and 10,000 years ago. It is transparent and has light golden-yellow color. This genuine copal amber specimen has excellent transparency for viewing the insects within it. There are several tiny winged insects still trapped inside this specimen. Copal Amber Dimensions: 4.7" long x 0.9" x 0.7"
This piece of natural copal amber was mined in Madasgascar. It has been partially polished by hand on some surfaces to better show the insect inclusions. This copal amber specimen formed from tree resin which hardened over time after falling to the earth between 1000 and 10,000 years ago. It is transparent and has light golden-yellow color. 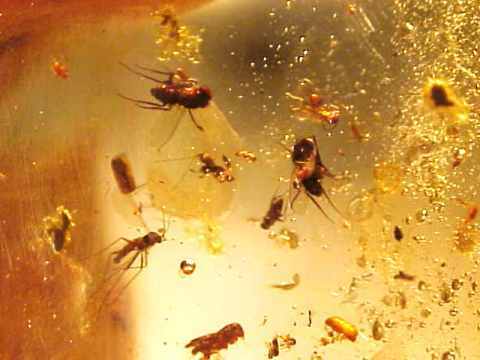 This genuine copal amber specimen has very good transparency for viewing the insects within it. There are over a dozen tiny insects still trapped in this specimen, and some organic debris. See also a full view photo of this natural copal amber with insects specimen. Copal Amber Dimensions: 7" long x 2.2" x 2.1"
This large piece of natural copal amber was mined in Madasgascar. It has been partially polished by hand on some surfaces to better show the insect inclusions. This copal amber specimen formed from tree resin which hardened over time after falling to the earth between 1000 and 10,000 years ago. It is transparent and has golden color. This genuine copal amber specimen has good transparency in most areas for viewing the insects within it. There are several tiny winged insects still trapped in this specimen, along with some organic debris. Alexandrite in Matrix Dimensions: 0.7" x 0.5" x 0.5"
This natural alexandrite in matrix specimen was mined in Bahia, Brazil. More than 50% of this specimen is alexandrite. The alexandrite is translucent to semi-transparent with dark green color under daylight, and it exhibits natural red-violet colors near some edges when viewed with strong incandescent light as shown. Alexandrite in Matrix Dimensions: 1.1" x 0.8" x 0.7"
This natural alexandrite in matrix specimen was mined in Bahia, Brazil. More than 50% of this specimen is alexandrite, with some naturally terminated areas. The alexandrite is translucent to semi-transparent with dark green color under daylight, and it exhibits natural violet colors near some edges when viewed with strong incandescent light as shown. Alexandrite in Matrix Dimensions: 1.3" x 0.7" x 0.3"
This natural alexandrite in matrix specimen was mined in Bahia, Brazil. The alexandrite is translucent to semi-transparent with some naturally terminated surfaces. It has dark green color under daylight as shown, and it exhibits natural red-violet colors near some edges when viewed with strong incandescent light. See also a photo of this natural alexandrite in matrix specimen with incandescent light. Alexandrite Crystal with Matrix Dimensions: 0.75" x 0.4" x 0.25"
This naturally terminated alexandrite crystal has a small amount of biotite schist matrix still attached. The alexandrite has dark forest green color under daylight. It is translucent to semi-transparent and shows a very strong color change to rich red-violet hues in strong incandescent light. See a photo taken under incandescent light of this natural alexandrite crystal. See also an opposite side view of this natural alexandrite crystal. Alexandrite Crystal Dimensions: 0.6" x 0.5" x 0.15"
This naturally terminated alexandrite crystal is twinned with a v-like shape. The alexandrite has dark forest green color under daylight. It is opaque to translucent and shows a very strong color change to rich red-violet hues around its edges in strong incandescent light. See a photo taken under incandescent light of this natural alexandrite crystal. See also an opposite side view of this genuine twinned alexandrite crystal. Alexandrite Crystal Dimensions: 0.8" x 0.6" x 0.15"
This naturally terminated alexandrite crystal shows cyclical twinning. It has a small amount of mica schist matrix attached on the backside. The alexandrite has dark forest green color under daylight. It is translucent to semi-transparent and shows a very strong color change to rich red-violet hues around its edges in strong incandescent light. See a photo taken under incandescent light of this natural alexandrite crystal. See also an opposite side view of this genuine twinned alexandrite crystal. Amazonite Rough Dimensions: 10.5" x 10" x 3.6""
This beautiful amazonite decorator specimen has light to medium blue-green natural color. It makes a very nice amazonite decorator specimen just as it is, although it could also be used as amazonite lapidary rough. See an opposite side view of this amazonite decorator specimen. Amazonite Rough Dimensions: 14" x 11" x4.3"
This large decorator specimen of natural amazonite has medium blue-green natural color. It makes a fantastic amazonite decorator specimen just as it is, although it could also be used as amazonite lapidary rough for making large spheres, bookends, and carvings. See an opposite side view of this large amazonite specimen. Amazonite Rough Dimensions: 16" x 11" x 7""
This large amazonite decorator specimen has light to medium blue-green natural color. There are some acicular black tourmalines on one side. See a side view showing the black tourmalines on this amazonite decorator specimen. This large amazonite makes a wonderful amazonite decorator specimen just as it is, although it could also be used as amazonite lapidary rough. See an opposite side view of this amazonite decorator specimen. This sphere has a very good quality finish. It was hand ground and polished in Brazil from natural amazonite rough containing accessory white albite and transparent gray quartz. The amazonite rough was mined at the Lavra de Amazonita mine in Minas Gerais, Brazil. The amazonite has a beautiful light to medium greenish-blue natural color. This genuine amazonite bracelet was handcrafted in sterling silver and set with five round cabochon gemstones of natural color blue-green amazonite that was mined in Brazil. These untreated amazonite cabochons measure from 11mm in diameter up to 16mm in diameter. See also a full view of this natural amazonite jewelry design. Large amethyst ring set with a gem weighing 11 carats! This natural amethyst ring has beautiful dark purple natural color. This heavy sterling silver ring was handcrafted and set with a pear shape untreated amethyst gem weighing 11 carats. The photo at left shows both a side and top-view photo. 2.8" long x 2.6" x 2.6"
This natural andalusite mineral specimen was mined in Minas Gerais, Brazil. The matrix is white semi-transparent quartz with many intergrown andalusite crystals. Some of the andalusite crystal's tips are in fair to good condition and these andalusite crystals have some tiny gem grade areas with pinkish-brown to greenish colors depending on lighting and orientation. 4.4" long x 3.9" x 2.3"
This natural andalusite specimen was mined in Minas Gerais, Brazil. The matrix is a mass of intergrown andalusites white some semi-transparent quartz. A few of the andalusite crystal's tips are in fair to good condition and have tiny gem grade areas with pinkish-brown to greenish colors depending on lighting and orientation. The photo at left shows a close-up view under daylight, see also a full-view photo. We also carry an assortment of stands for small & medium sized sphere and minerals. This is the end of page #1 of our Spectacular Items of All Minerals. See also our page #2, page #3, page #4 and page #5. Would you like us to inform you when we add on this page more collector and decorator mineral specimens or rare quality and extra large size?